This is a post in Keeping the Flame’s “Farewell Denton” Series. This week will feature one post per day up until moving day (May 22), and will feature reflections on my undergraduate experience, posts about Denton in general, and posts about graduation! In no particular order, these are my top five absolute favorite eateries in the city of Denton. While I am so excited to live in a place with a lot more local choices for delicious food at all price levels (cough AUSTIN cough), I have spent countless hours in the past five years finding the local places that are worth trying a second time. Or a third. Or a fiftieth. Residents of Denton will appreciate this list. Visitors to Denton may find solace that all is not lost if all you see is Chili’s and Subway. Contrary to appearances, we DO have other restaurants here! This list should provide you with an option regardless of which meal you’re seeking. Yay for delicious, local food! This lovely spot has the best breakfast in all of Denton. Trust me on this one. You’ll want to be prepared to wait a few minutes, because the place is ALWAYS packed. Parking can be a bear, and everyone just parks wherever there happens to be 6′ of unoccupied space. 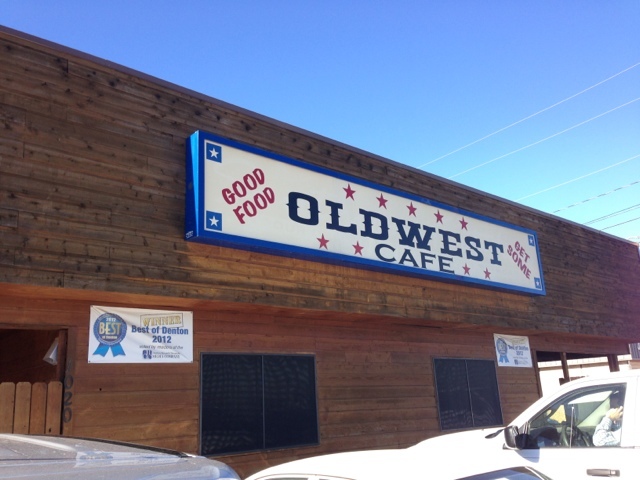 Oldwest holds a very special place in my heart because I ate there with friends to celebrate the conclusion of our two hardest music education courses. Arguably, the food was so good that it made all the stress worthwhile! I’d recommend any of their french toast options. Be aware– if you’re hankering for waffles, go somewhere else. They don’t have them!! It’s a small price to pay for all the awesome you’ll get on your plate instead. Be prepared to get a BOATLOAD of delicious food for very little cash. Most of my friends order a to-go box with their meal… but this is one of the only restaurants where I regularly clean my plate in-house. It’s that good!! Be sure to go before 2pm! This place off the square may not look like much on the outside, but believe me when I say it is the best fine dining experience the Denton area has to offer! Delicious gourmet food options, unbeatable service, an extensive wine list/ cocktail menu, and desserts to die for make this my top choice for a special occasion. Hannah’s also has their own private parking lot, which is a fantastic perk this close to the square! Rumor has it that Hannah’s affordable Sunday brunch features mimosas and is worth driving from Dallas for. I haven’t tried it myself. I have fond memories of attending Hannah’s for my 21st birthday and ordering my very first martini. We also made reservations here for my graduation celebration dinner! If you’re looking for a place to have a fancy dinner in Denton, you’ve found it! This charming Italian restaurant off the Denton square is my favorite spot for taking guests out to dinner! The food is consistently delicious, and combined with the fancy table cloths, wine list, and affordable prices, this place becomes a huge winner. I always recommend their veal or eggplant parmigiana, but everything we have ever ordered has been fantastic. This is the place to go if you’re a little dressed up and want something special, but don’t want to break the bank or have to make a reservation. My fondest memory of this place are eating here with the whole extended family after my dual-instrument non-degree recital junior year. This adorable tearoom on the Denton square offers my number one choice for brunch anywhere around! I have eaten at Chestnut Tree so many times over the years that it’s hard to pick a favorite memory. I remember eating here to celebrate Christmas with my Wesley small group a couple years in a row, taking friends here to celebrate birthday brunch, and bringing the ladies in my family when they came to visit campus. Chestnut Tree is famous for their homemade beer bread– I always order their club sandwich served on beer bread with homemade soup, and take half of it home. If you don’t order a sandwich on this bread, PLEASE just order a slice on the side. You’ll thank me later! You do not want to miss this. Be prepared to wait a few minutes at peak times (Saturday morning…) and get ready to park a little ways away. I don’t mind walking at all, since you get to see the charming Denton square! Again, this place doesn’t look like much from the outside… but if you’re looking for a fresh, affordable, and filling lunch close to UNT campus, look no further. This burger-joint-turned-asian-fusion restaurant has the best vegan/vegetarian options in town, and I loved it even while I was still an enthusiastic carnivore. Their grilled chicken is amazing and can be added to any bowl. I also love their cucumber-infused water (fresh daily) and their delicious juice and smoothie options. They also have delightful teas. I always order one of their “yogi bowls,” which is packed with veggies and rice and always serves as two separate meals when I take it home. Yay for delicious leftovers! Instead of eating at the Chic-fil-a in the Union, do consider popping over here for some absolutely delicious healthy food. The Bowllery is also open for dinner! Viet Bites (Best banh mi), Beth Marie’s Ice Cream (Best dessert), Ravelin Bakery (Best freshly baked treats), Thai Square (Best Thai food), Loco Cafe (Best biscuits), Burger Time Machine (Best dive burger), New York Sub-Hub (Best sandwich), Paschall’s (Best bar), and Zera Coffee Co. (Best coffee shop). I will definitely miss these delicious spots. These have grown to be some of my favorite places in all of Denton, and I have many fond memories of good meals and good company! I am so excited to discover a whole new list of favorites when I move to Austin.